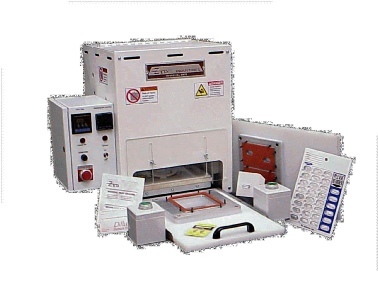 Table Top Laboratory Blister Sealers for R and D applications such as testing and evaluating packaging materials such as blister packs and thermoform trays. Tray sealing machines for production packaging of small trays. This tray sealing machine is a single-sided, shuttle-type sealer which utilizes low cost, quick-change seal tools, and is typically used for standard carded blister applications. Tray sealing machine can also be configured to seal Tyvek, foils, thin plastic sheets and laminated film lid stocks. This blister sealer tray sealing machine, is designed for evaluating and testing blister packaging material and medical thermoform trays. This tray sealing machine can evaluate lidding materials such as Tyvek for thermoform trays for medical devices packaging.The platen size for this tray sealing machine is 10 x 10 inches, and can seal medical thermoform trays that are 2.5 inches deep.